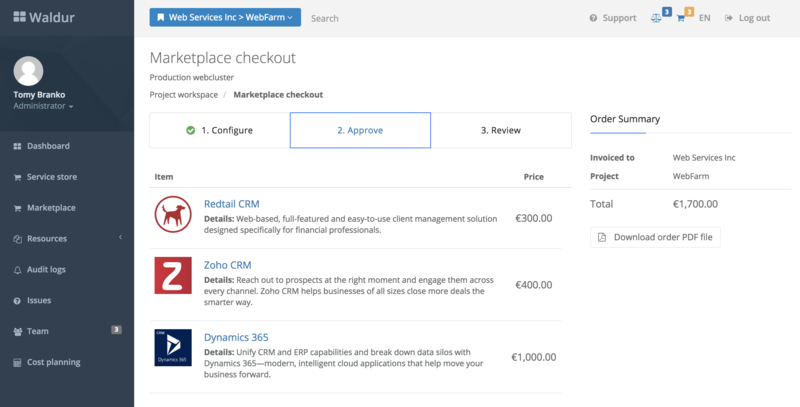 Waldur | Open-Source Cloud Marketplace Waldur Open-Source Cloud Marketplace | Waldur is a platform for creating hybrid cloud solutions. It allows building enterprise-grade systems and providing self-service environment for the end-users. Waldur is a platform for creating hybrid cloud solutions. It allows building enterprise-grade systems and providing self-service environment for the end-users. A digital platform for publishing and managing cloud services. 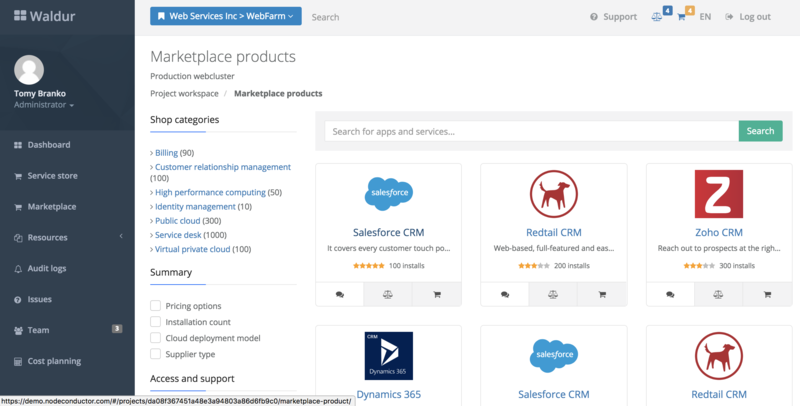 Comes with a wide range of supported integrations. Includes a state-of-the-art self-service portal for the end-users supporting social, national and federated identity providers. Real-time, historical and predictive reports for service providers, consumers and summary views for the Waldur operators. Built-in accounting and integrations with third-party billing systems. Support for one-time, usage-based or periodic billing models. Integrated customer support ticketing with third-party helpdesk backends. Can be used to provide a single support line for all managed resources. Open-source, extendable and comes with a professional support. API-first design and comes with modules for management by Ansible. Publish high-level Service Provider APIs to your customers, enabling programmatic Marketplace access and resource lifecycle management. Funnel resources from private and public clouds. 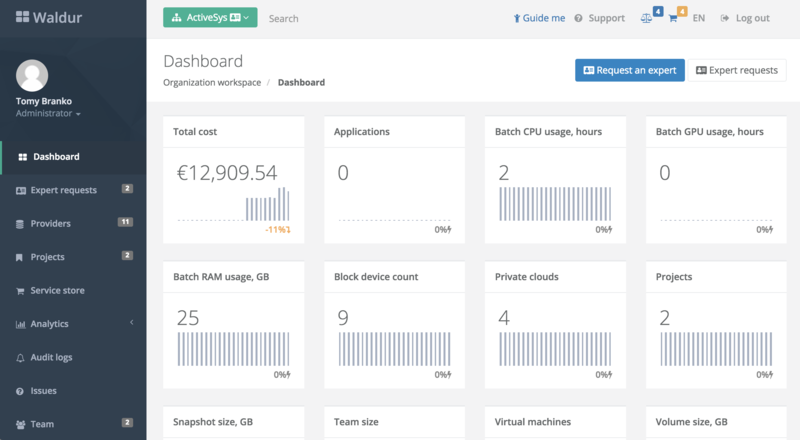 OpenStack, AWS EC2 and DigitalOcean are supported, along with many more. Let your customers invite people into project teams and delegate resource management within project workspaces using simple role-based access controls. Empower your customers with a self-service portal for easy resource lifecycle management and for achieving better end-to-end visibility. Trackable events, alerts and notifications, always available to your customers for compliance and activity monitoring. Built-in predictive cost estimating and usage-based resource accounting helps to get clear view on finance for all sides. 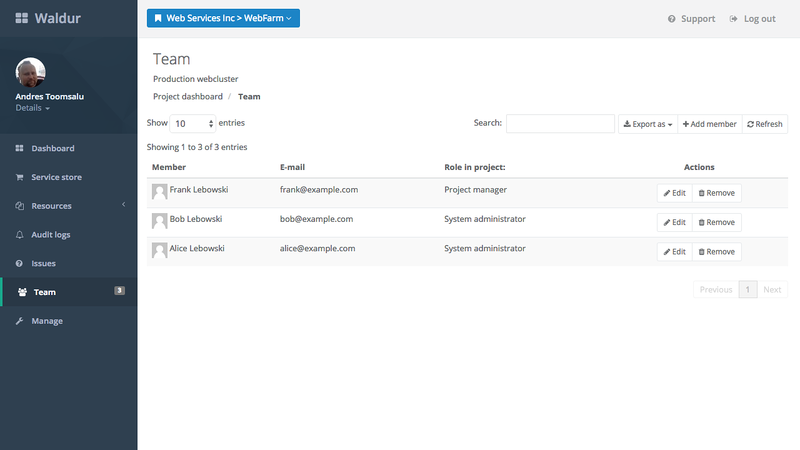 Waldur includes support ticketing functionality and integrates with third-party Helpdesk backends. Having high precision data from various sources provides vital insights into your end customers behaviour. 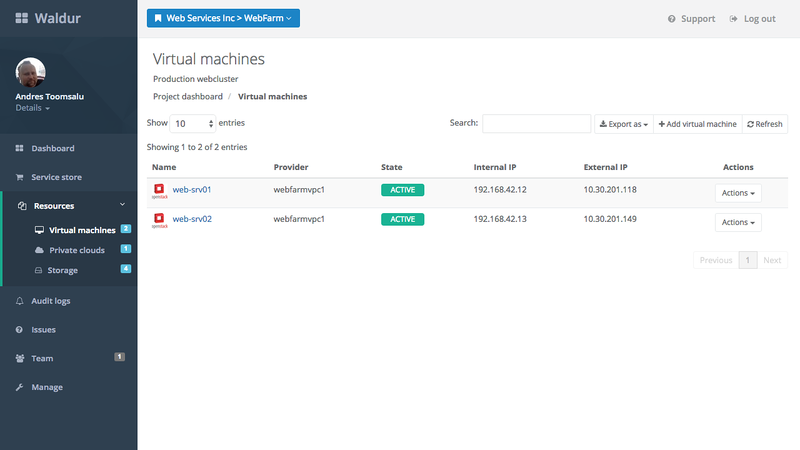 Support subscriptions and deployment services are available for running Waldur in production. Waldur HomePort splits management functionality into workspaces that are used by users in corresponding roles. 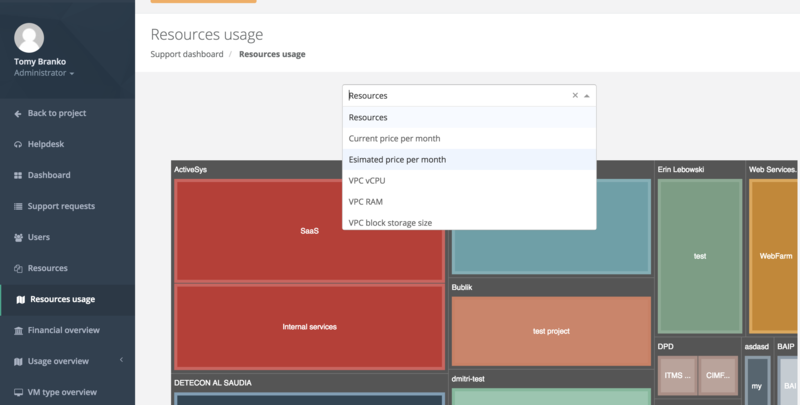 Waldur supports management of resources from both public and private cloud providers through a single pane of control. Оrganization and project teams management is done with invites-based delegations. Allows to maintain full control over access grants while streamlining operations. Service provider management provides detailed information about certifications and terms of services of a particular solution, as well as allows to see prices and SLA terms. Service Store allows to provision resources from the available service providers that match policy configurations for a particular project. Service Store offers a common provisioning flow for heterogeneous cloud providers. Reporting view allow to understand resource usage by customers according to different attributes in a compact and clear view. Marketplace module allows to browse and compare offerings of different types in a clear and transparent fashion. Marketplace module allows to compare offerings by each attribute, making a decision for selecting a product more fact-based. Waldur MasterMind cloud orchestrator exposes REST API service that enables end-customers to access Marketplace, organization, project and resource management functionality. MasterMind comes with advanced Admin Portal interface for operator-only use. MasterMind is highly modular. Modules are divided into Core, AuthN, Value-add and Provider groups. For example, Core modules deal with standardized global objects while Provider modules map and handle backend specifics. Core functionality can be extended and customized further with Value-add modules and identity providers are fully pluggable. Provider modules allow to integrate and connect with in-house infrastructure orchestrators, existing systems and public cloud endpoints. Waldur HomePort is a state-of-the-art Self-Service Portal targeted at the end customers. It is built as ReactJS application and communicates with MasterMind API service directly from a browser. It provides a graphical user interface for Marketplace catalogue, dashboards, resource management and much more. HomePort includes Helpdesk functionality for convenient interaction with operator’s support team. OpenStack is a popular open-source solution for building private Infrastructure-as-a-Service solutions. It is provided by multiple vendors that allows to reduce lock-in for the infrastructure. 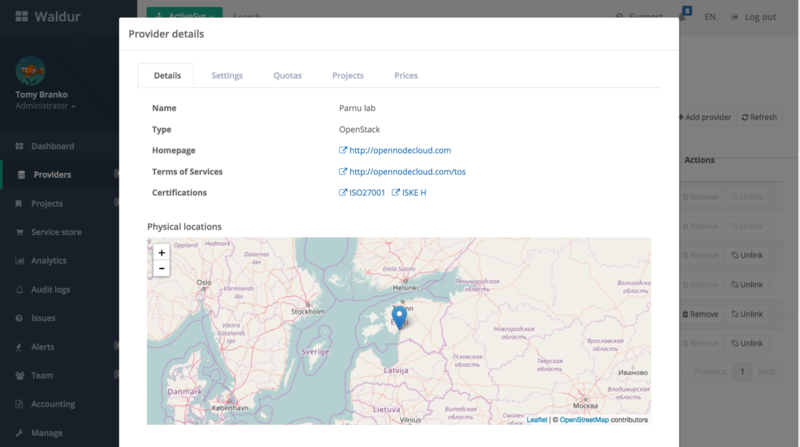 Waldur provides native integration with OpenStack APIs and adds value by extending several aspects of OpenStack deployment. Waldur works with OpenStack versions from Liberty onwards and supports Keystone, Nova, Cinder, Neutron and Glance components. Contact us to find out more! Username/password (local / LDAP). Possible to integrate SAML-based authentication. Self-registration is not possible. Organization-friendly user model with support for self-registration, invitations, profile management and project team management. Available, most of features of OpenStack are exposed to the users via Horizon. Support for basic and advanced modes. 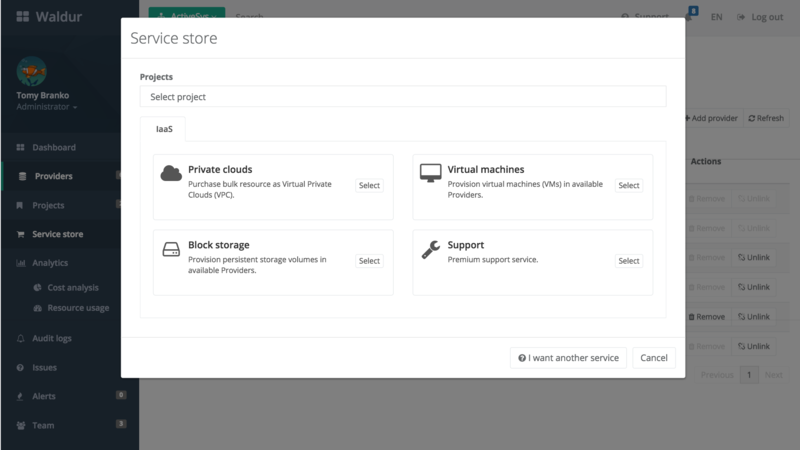 Basic mode provides simplified and standard ways for creating private clouds and VMs in OpenStack, which also doesn’t allow to create "broken" infrastructure. Advanced mode means providing full access to OpenStack with limited account. Basic access management for users in OpenStack tenants. Support for setting organization-level policies by infrastructure operator as well as limitation by organization on project level (required certifications, maximum monthly costs, permitted cloud services). Typically is used for management of in-house resources with KVM. Experimental support for management of other virtualisation stacks. Designed to support multiple cloud services, including OpenStack-based private clouds, public clouds (DigitalOcean, AWS, Azure) and batch resources (SLURM, Moab). OpenStack integration does not require intrusive modifications OpenStack. Support for basic (email-based) and full API-level integration with Atlassian ServiceDesk. Resource creation / modification logging, business events are not logged. Supported through Heat or Murano extensions, which require extra management. Not possible to deploy across multiple clouds. Supported through Ansible-based playbooks that allow to provision applications and platforms across hybrid infrastructure. Usage accounting of consumed resources. No concept of show/chargeback, billing periods, invoicing. Support for custom billing models on monthly basis, support for accounting or invoicing models, support for payments. Self-service displays full history of resource consumption with prices and usage details. Proof-of-concept solutions exist, however mostly used for in-house resource management. Support for Azure, DigitalOcean and AWS clouds. Operator-driven, through experimental OpenStack components. Possible to import private organization's cloud deployments and limit its use to one organization only ("bring-your-own-cloud"). Considerations for deployment and configuration of Waldur as an operator. Example of a user guide that could be tailored for a concrete deployment. Technical guidelines and documentation for contributors. MasterMind guide, HomePort guide, Contribution policy. Waldur MasterMind is designed as API-first application.